Vitamix fans, this one’s for you! 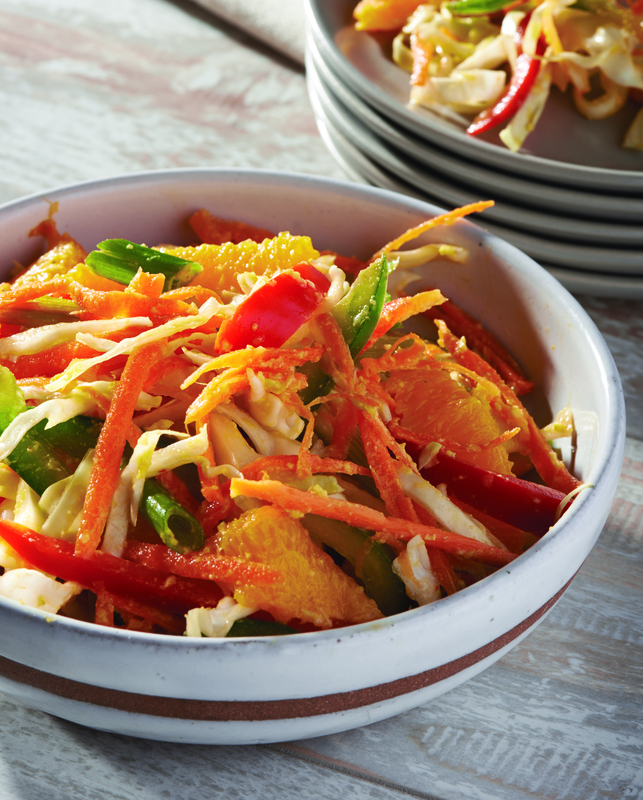 Today we’re sharing a recipe that will become one of your staple salads in the kitchen: Lime-Dressed Ginger Carrot Slaw. This salad is light, bright, crunchy and tangy, and best of all, the dressing can be made easily in your Vitamix. We can’t wait to dive in! Recently known primarily to professional chefs, over the past decade the Vitamix blender has become one of the most sought after kitchen appliances in home kitchens. Now, Vitamix has created a gorgeous companion cookbook to help you enjoy the benefits of a whole foods diet. The Vitamix Cookbook by Jodi Berg contains more than 200 simple, scrumptious, easy-to-prepare recipes that use a Vitamix blender—most taking less than thirty minutes. The Vitamix Cookbook is on sale October 13th, but if you pre-order your copy before then and fill out this form, you will receive a free Vitamix water bottle (while supplies last). What better way to get a bigger variety of veggies into your next BBQ than to whip up this colorful, vibrant slaw! This salad is a brightly colored tangle of green, red, and orange all tossed in a tangy, slightly spicy dressing. The salad uses about half the vinaigrette, the remainder of which can be used to marinate meat or veggies. 1. For the lime dressing: Place all the dressing ingredients into the Vitamix container in the order listed and secure the lid. Select Variable 1. Turn the machine on and slowly increase the speed to Variable 10, then to High. Blend for 30 seconds. 2. For the salad: Combine all the salad ingredients in a large bowl. Add half the dressing (refrigerate the remainder for another use) and toss well. banknote advances which acquiesce you affected your banking crises dollars for lending products.